If most organizations focus on fixing those two issues, they would see an immediate uptick in higher quality leads. Webinars play a very important part in content marketing and lead generation process. The people who register to participate become warm leads (and you can learn if they watched it, how long they spent on it, and what parts they viewed). But the benefits don’t stop there. Lead magnets are one of the most popular methods to gain this data, where valuable content is gated, meaning personal information (email address, profession, etc.) is required before this particularly special content is unlocked. Just always ensure your content is massively helpful to your target audience. Your content needs to be tied to a strong value proposition that will compel the user to give you their email address or other contact information. Traditionally done with a lead magnet, it’s easy to get wrong or miss out on great opportunities to convert a visitor. You need to ensure you have a highly compelling offer that visitor will want to access. You need a clear call to action, a lead form box, and a way to deliver your offering automatically (e.g., Mailchimp). Most importantly, you want your lead form to require as little information as possible. For example, if you ask for a phone number, a mailing address, and more, few people will convert into a lead. If you ask for only an email address, you will have a much higher conversion rate. Incorporate one or more calls to action into each piece of content marketing. Each page should provide an entryway to your content marketing offering. The key to proving content marketing success is to build the appropriate metrics into your distribution with related tracking codes (or UTMs) before you hit publish. Use codes based on your platform option, presentation format, distribution date, metrics, and any goals or related results for comparison. Among the questions you need to answer about your audience is what triggers will motivate action. Not every interaction with your content will convert to a sale, but content should always give the reader something to do next. Inevitably, that next step is to inquire, buy, refer, or share. Content marketing should help buyers lead themselves to the conclusion that your solution is the best answer to the problem they’re trying to solve. Higher search rankings lead to more traffic, which you can then convert to leads using smart calls to action. I like to use a WordPress plugin called “Append Content” to automatically add calls to action to the end of each blog post. You can also use a tool like Hello Bar or OptinMonster to customize the calls to action based on the page the user is viewing, which really helps step up your targeting. Offer information that helps your audience learn about a subject, make decisions, and build a connection with your organization. To me, this looks like offering a great piece of downloadable content and continue to nurture the lead. I love e-books and checklists for this kind of lead generation. I also think live events are a wonderful way to talk and connect with your audience and offer them a free piece of content that only they have access to because they came to your talk or booth. The best way to get leads in content marketing is through subscribers. Create content good enough that your audience wants to subscribe to it. Then nurture those subscribers to leads through valuable offers. Target comparison keywords. Buyers who are looking at your service may not be fully convinced you offer exactly what they are looking for. As a result, they will compare your product with the competitors they know of in your space. Create comparison landing pages to drive leads and sales from comparison shoppers. Use the power combo of Facebook Live and Messenger chatbots to generate leads. Start by using Facebook Live on a regular basis. Use a third-party desktop tool such as BeLive.tv. Consider a weekly show of between 20 and 60 minutes. Pack the show with plenty of valuable, educational takeaways. Then, throughout the show, encourage your viewers to comment on your broadcast with a special keyword to access a desirable giveaway. Another powerful and effective method is using Instagram Stories and IGTV. Business accounts with more than 10,000 followers have access to the swipe-up feature to add links to Stories. However, any account can add a link to videos on IGTV where any links in the description are active. Publish a snappy 15-second video Story that encourages viewers to swipe up to your IGTV video, where you have a special offer and a hot link. Drive your audience to a relevant giveaway. A great example to follow is @buffer – I love the way they’re using Instagram Stories. Distribute your content to niche communities such as GrowthHackers.com, Zest.is, SaaS Invaders, Quora, and Indie Hackers, or wherever your ideal customers spend their time. Content distribution to niche communities generates traffic and brand recognition, which generates leads. This method is especially effective when you engage in these communities and build genuine relationships with other members. The stronger your relationships are in the communities most relevant to your space, the larger your audience of qualified buyers will be, and these people will naturally want to share their contact information with you. Whether it’s a relevant call to action or gated content, lead generation can take many forms. By incorporating it into your content marketing strategy, you will be better positioned to help grow business. 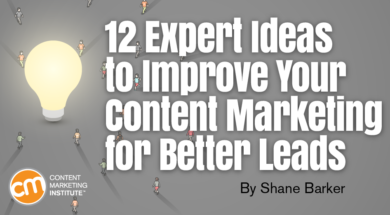 What tactics have you found successful to generate leads in your content marketing programs? Please add your ideas and strategies in the comments. Want to get expert insight to improve your content technology? Make plans to attend ContentTECH Summit April 8-10 in San Diego. Register today using code BLOG100 to save $100.